Avebury Stones the Avebury Henge in the Uk, What is a Henge? 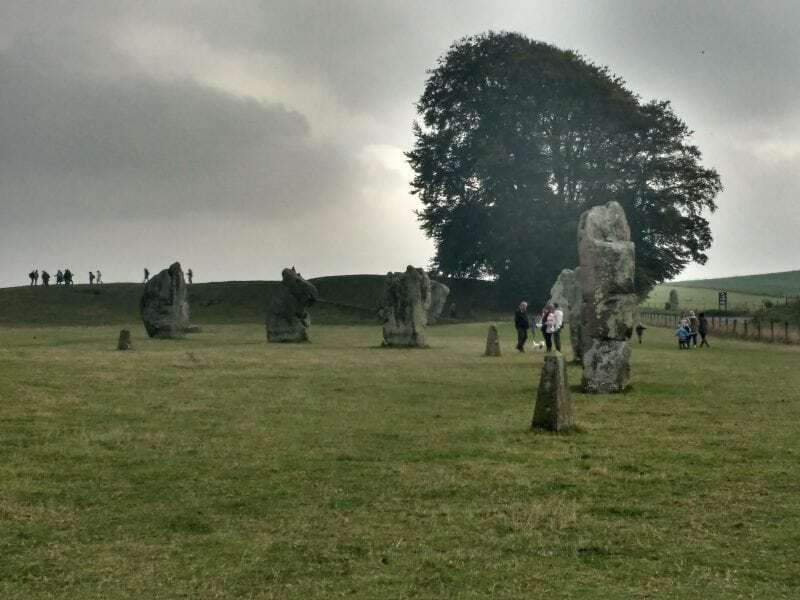 Most North Americans have heard of Stonehenge the towering megalith in the South of England but few have heard of Avebury Henge, which is a much more accessible site. Due to tourists and vandals Stonehenge has become a location that you can only access from a distance, there is no longer anyway to get close to the stones and the tickets to visit are very expensive running around £25 each adult. 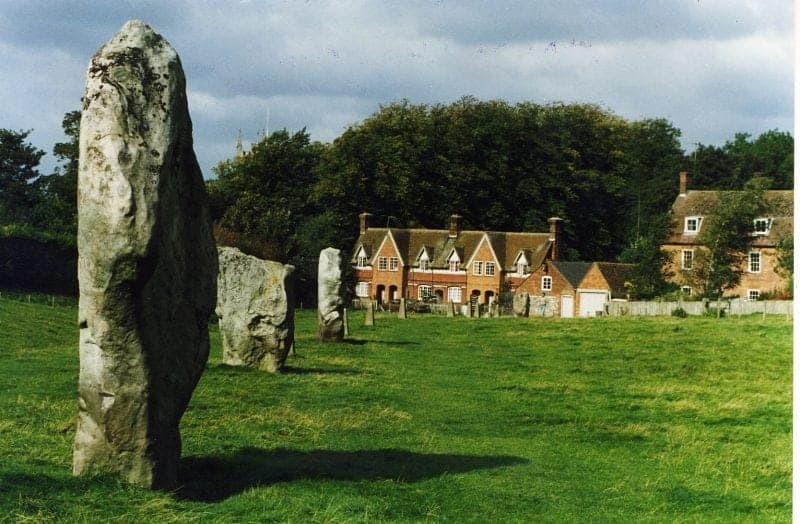 The Avebury stone circle is free to visit the stones but you can pay for a ticket to see the museum and Manor House. Archaeologists define a ‘henge’ as having a ditch on the inside and a bank on the outside; Stonehenge is the other way round. Having a ditch inside a bank is not a practical arrangement for defensive purposes, so henges are assumed to have had a ritual function. (The full definition is ‘a nearly circular or oval flat area over 65 feet across that is enclosed by a boundary earthwork that comprises a ditch with an external bank pierced by one, two, or four entrances’.) The most famous true henge in the UK is probably Avebury, about 20 miles north of Stonehenge. Over 6000 years ago the people living in this area of Wiltshire also built a Neolithic stone henge which is comprised of 3 circles and is the most important site of its kind in Europe. Avebury Henge has been a place of worship and religious importance for centuries. A henge is a bank and a ditch with a larger outer stone circle and two smaller circles within the centre. The original purpose remains a mystery to this day, although it is believed that the most likely use was for ceremonies or rituals. The Avebury site is part of a larger prehistoric landscape that includes Silbury Hill, the largest man made hill in Europe and the West Kennet Long Barrow which is a tomb. 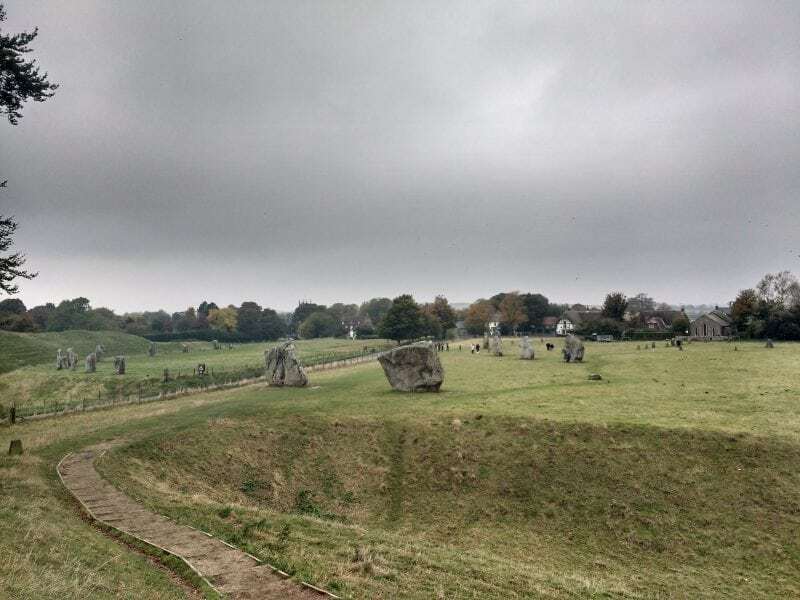 Avebury is a treat to visit, the henge sits in and around a stereotypical English village although over the many years since it was built many of the stones have been moved to accommodate crops and build houses. Hundreds of years ago the Avebury Henge was not considered a monument and a place to be revered it was a nuisance and the giant rocks just got in the way of doing business so to speak. 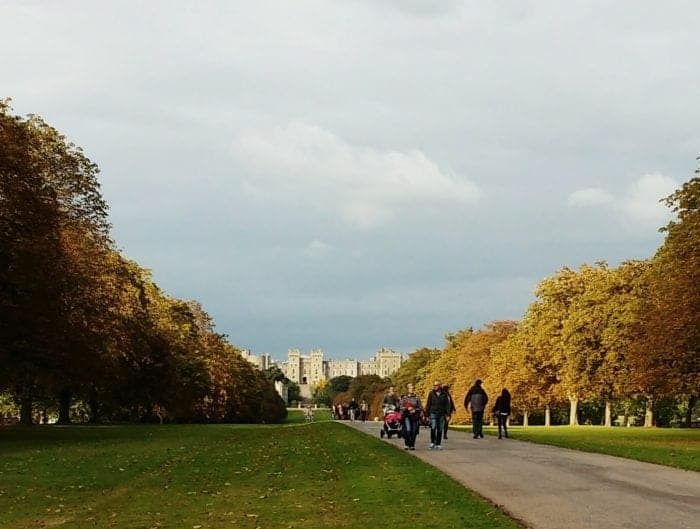 It is only in recent years that the Henge has come under the guidance of the National Trust and become a revered monument. The real brutal assault on the fabric of the Avebury Henge appears to have begun in the late 17th Century when the local inhabitants found ways of breaking up the stones so they could be used as building material. In the Middle Ages the stones may have been associated with pagan and devil worship and many were either buried or destroyed. Later building and agricultural improvements led to others being removed. 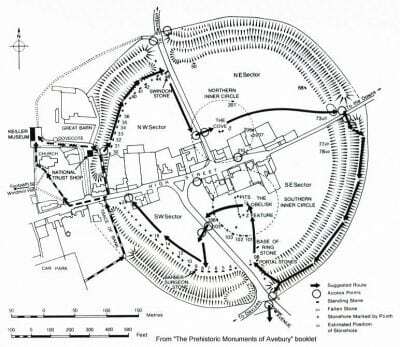 The ditch and bank formation that surrounds the Avebury Henge has to be one of the most amazing feats of engineering in the world. In early photographs taken when the ditch was being excavated it was discovered that the depth was originally around 55 feet deep, with a length of just over a kilometer. These days erosion and silting have reduced the ditch to about a third of its original depth. Avebury is a Neolithic henge that contains three stone circles, around the village of Avebury in Wiltshire, in southwest England. Avebury is approximately 2 hours from London give or take the driving conditions. One of the best known prehistoric sites in Britain, it contains the largest megalithic stone circle in the world. 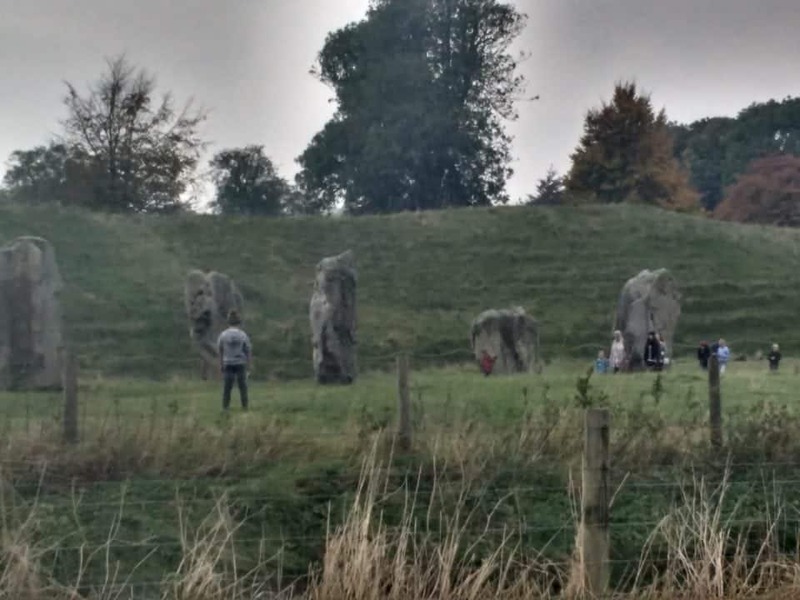 It is both a tourist attraction and a place of great spiritual importance to pagan and Wiccan worshipers, You can get to Avebury via bus and train however the journey will take anywhere up to 4 hours travel time. There are four entrances to the circle each roughly at the cardinal points of the compass. From the south and west entrances going away from the henge are the remains of two stone avenues. The Beckhampton Avenue which runs from the west entrance is barely evident to-day although, almost a mile from the henge, the two Longstones still stand to reveal where it once existed. The West Kennet Avenue which runs from the southern entrance has survived much better and still presents a spectacle as it stretches across the countryside on its way to joining with the small circle of the mysterious but now destroyed Sanctuary a mile and a half distant. Driving into the village the stones appear out of nowhere they encircle the whole village. 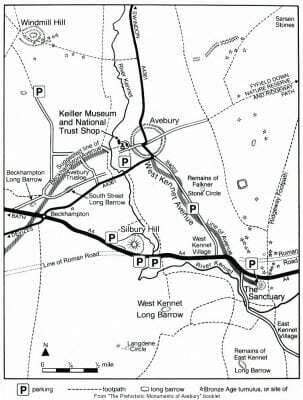 The National Trust Avebury manages the henge and their car park has clear directions and is the only place to park, the cost is £7 per day, although the Henge is free to wander. There is a short cut path from the car park to the village and the loop around the stones. 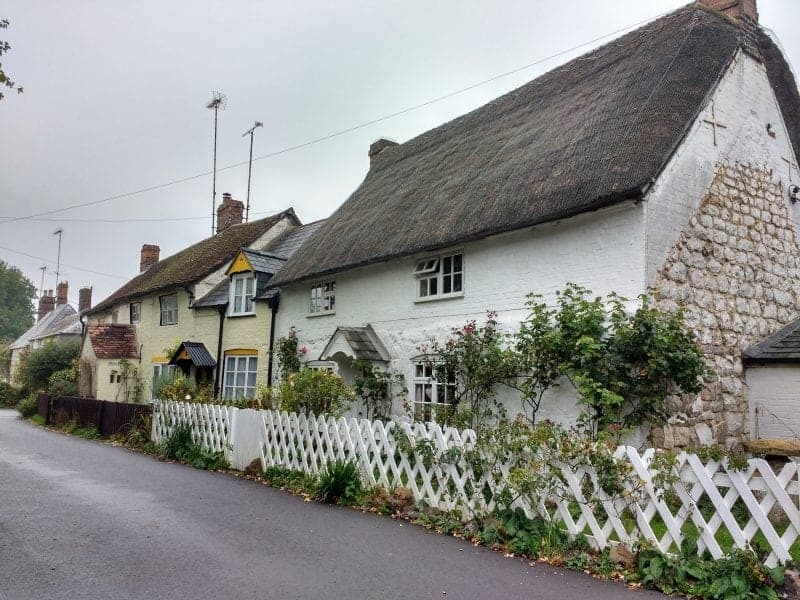 The village of Avebury is quintessentially English with thatched cottages, lovely church and bucolic scenes of sheep meandering around the stones. It sits within the stone circles of the Avebury Henge. There is a walking path all around the henge and you can wander the fields (watch out for sheep poop) to venture up close and personal with the stones (advice here is to wear good hiking boots or shoes and be careful the paths are slippery with mud and sheep leftovers). The village is very pretty with lovely thatched houses and the church of St. James which has a long history going back to Saxon times. There is also a fine manor house alongside which is the Alexander Keiller Museum. This contains a lot of information about the archaeology of the monuments and has many fascinating artifacts from the area on display. 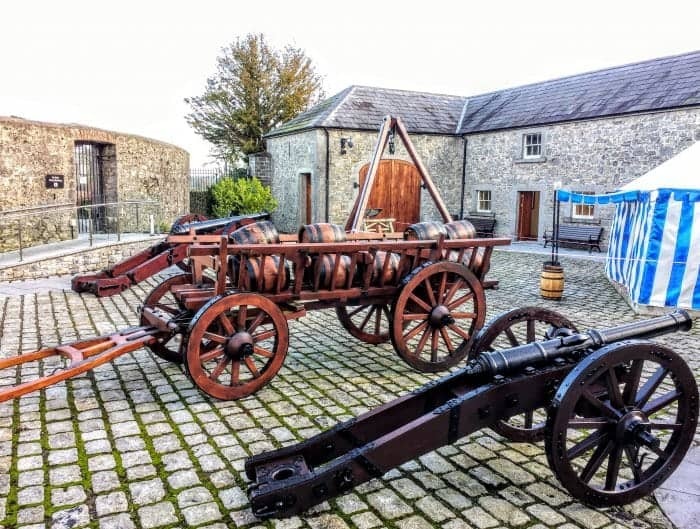 There is also the Barn Gallery which also contains some interesting “hands on” exhibits and other information supplied by the National Trust under whose care the monuments now fall. 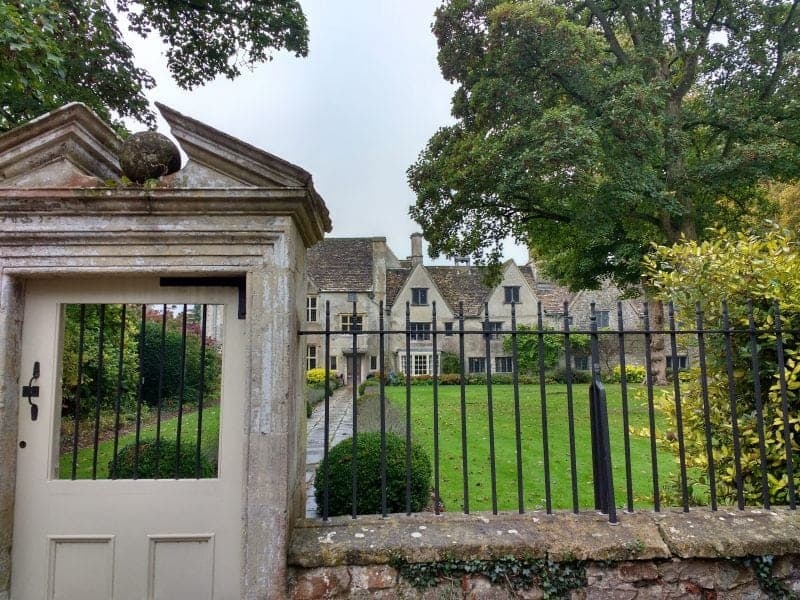 Tickets for the Manor and the Museum cost around £11 per adult, but they are not necessary to visit the stones themselves. Off the High Street is St James Church, visitors are welcomed and you can go inside. 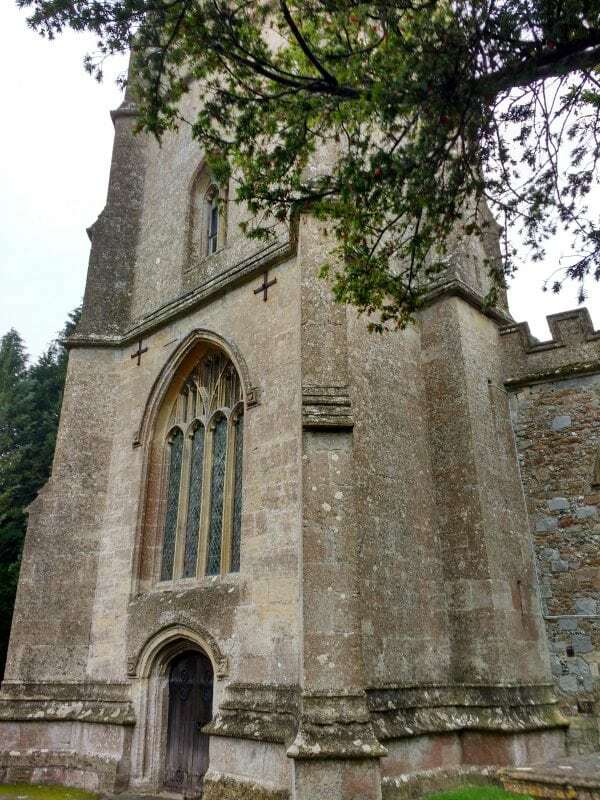 The church has a long history going back to Saxon times, though much of it you see now is medieval. Within is a rare example of a medieval rood-loft once hidden but rediscovered in 1810. It also contains a font believed to be of Saxon origin and later adorned with some interesting carvings during the Norman period. 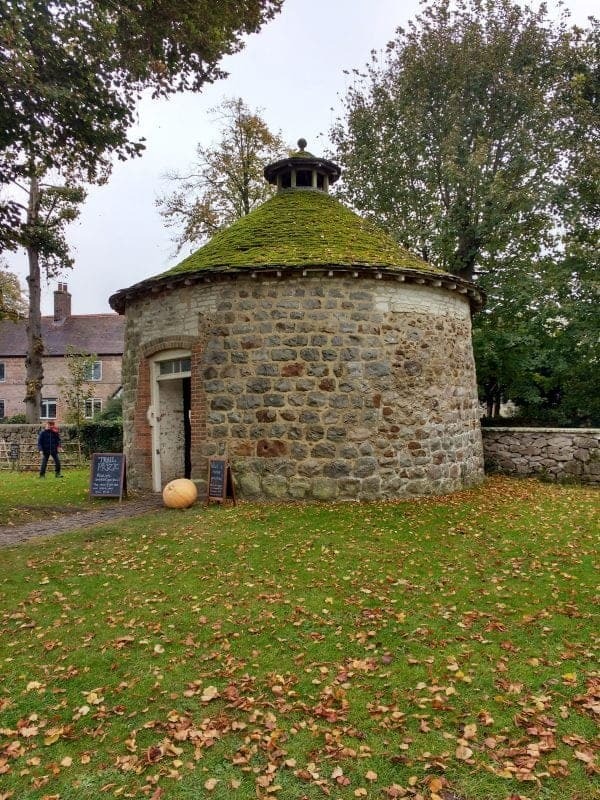 There is also a Dovecote, normally open so you can see the perches for the birds and a National Trust cafe provides snacks and meals (somewhat expensive so it may be better to pack a picnic lunch). 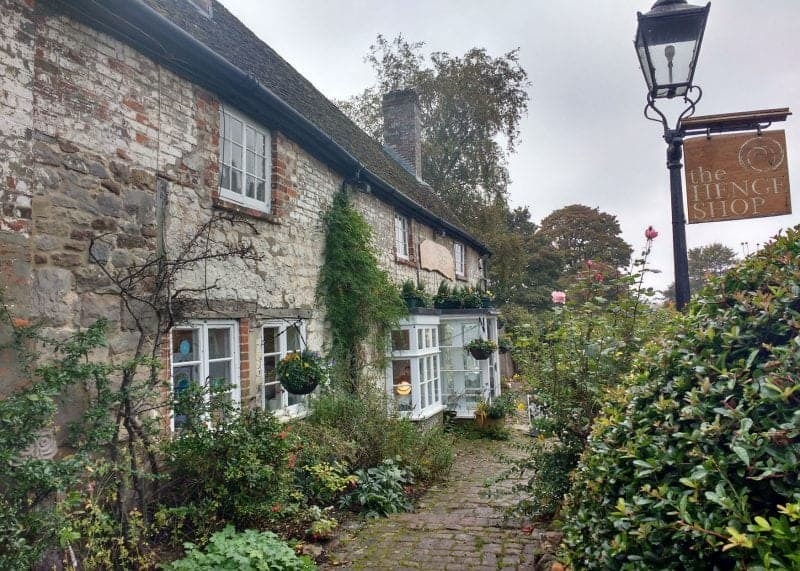 The Henge Shop at Avebury is an independent shop, and if you love the mystical, magical or alternative this is the place for you. This quirky shop has a brilliant alternative/new age/mystical book section and it stocks loads of postcards if your own pictures of the stones don’t measure up. The shop also contains a wide range of small gifts from gold, silver and pewter jewellery, scarfs and woollens, t-towels, tee shirts, hats, dowsing rods, minerals and fossils, enough to please any new age pagan. 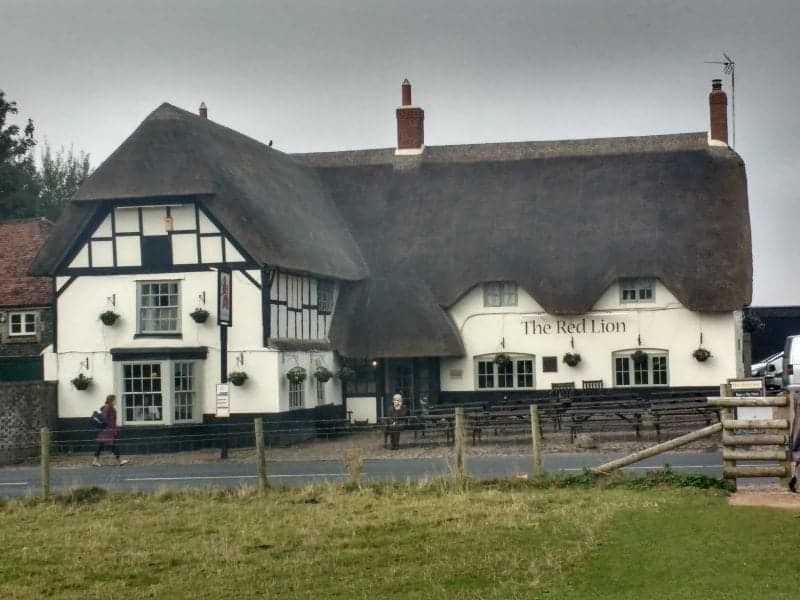 Once you have finished visiting the Avebury Henge take some time to grab a bite Avebury’s most famous pub the Red Lion before either hiking over to Silbury Hill, or just grab your car from the parking lot, turn right upon exiting and follow the sign posts, you will see the remarkable hill just off in the distance. 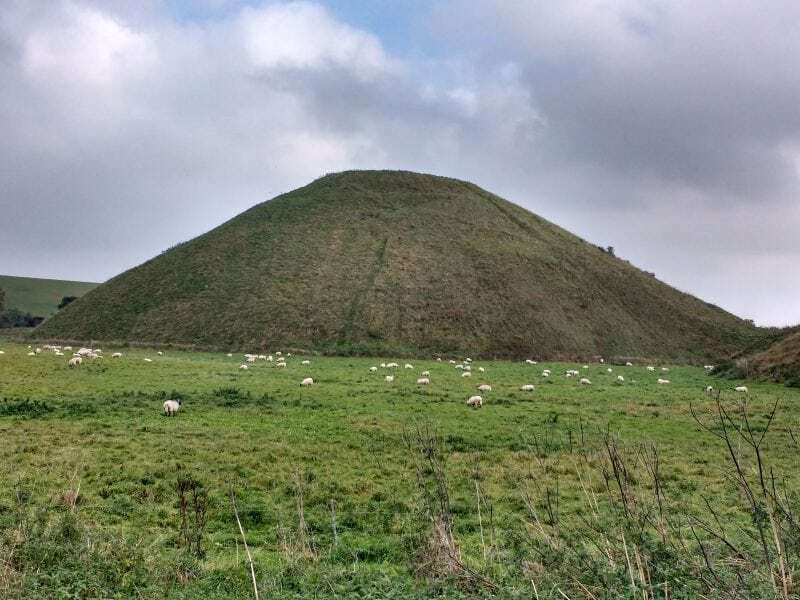 Silbury Hill remains one of the most enigmatic monuments left by our pre-historic ancestors. Despite various attempts using tunnels to try and discover the secrets of this 130 feet high wonder of engineering it still continues to baffle and impress us. The Hill is the largest man made monument of its kind in Europe and currently is fenced off to protect it from erosion and tourist damage but it is a quietly serene sight to visit. Beyond Silbury Hill and on the other side of the main A4 road you will fin the West Kennet Long Barrow which is the largest example of a barrow tomb in the UK. Peering through the trees you will see the East Kennet Long Barrow, it is somewhat larger than the West Barrow and still waits to be investigated. One of the best websites with a vast archive of information is the Avebury Web, it details the archaeological digs, the history, vandalism, and speculates on the nature of the mystery that is Avebury. It’s a shame about the vandalism of Stonehenge. Putting the village on my list of things to do! It’s nuts of people that vandalize these destroys it all for the others that knows how to show respect. Thank you for making me discover about Avebury – I have never heard of it in the past! Wow, wow, wow! This looks like a wonderful place to visit. I so want to go there now! I’d love to see Stonehenge, too. I’ve been close, but have never made it there. 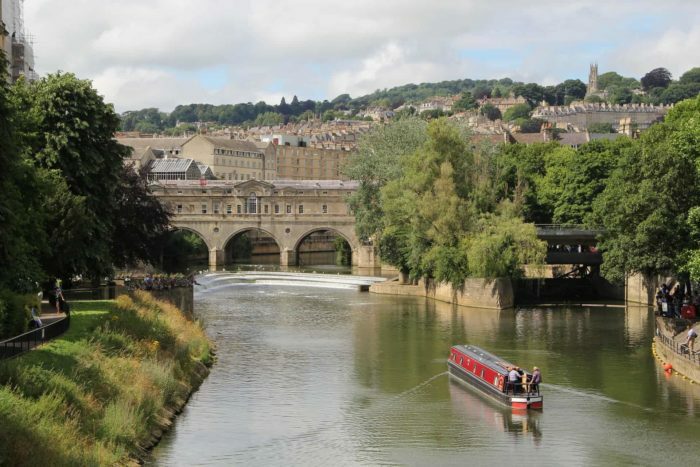 This place looks like a wonderful way to really get up close to the stones and see it from a completely different vantage point and seeing it in the middle of a lovely English town is all the better. Thanks for sharing. I know isn’t it adorable, they were packed to the roof with all kinds of crystals, books, magical implements and gorgeous jewellery it was an absolute treat. I love Avebury! I went there last year and thoroughly enjoyed seeing the stones. I liked them more than Stonehenge as they are lesser known and you can actually walk up to them. The Henge shop is quite nice. Hubby and I bought a few books from there. This is a very interesting place to visit. I’m always in awe by some of these historic monuments and how they’re able to survive for several centuries. 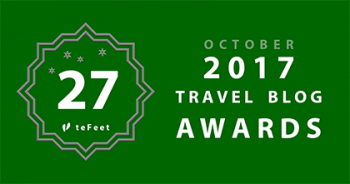 Definitely included this in my travel bucket list! Never heard about Avebury before, looks very pretty. 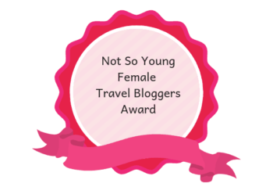 Definitely need to add this on my list! I’ve never heard of this place before, only Stonehenge, but this looks like it is almost better since you can get so close to the stones! I’d love to visit! I’ve been obsessed with standing stones after reading the Outlander series and was extremely disappointed about how far back you have to stand to view stonehenge. I’ve never heard of Avebury before. The standing stones and the grounds look amazing though! I live a mile from Avebury and it’s very lovely here. Please remember that it’s a living village and try and avoid busy weekends when parking can be a nightmare! We also have a community shop that sells groceries, drinks and sandwiches – run by a small committee of local people it is staffed by volunteers and celebrates its 10th anniversary this year. Excellent points Magrathea that was exactly what I liked about Avebury it was a lovely little community. We bought our drinks and snacks at the local shop and were really impressed by the feel of the community. I hope everyone respects and honours the place as it deserves it.